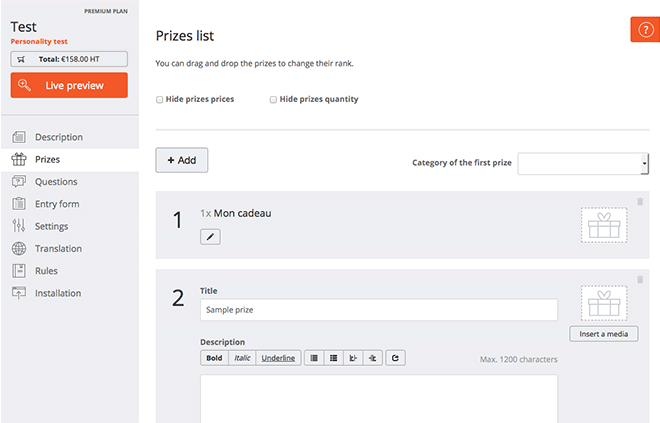 For each gift, you can enter a title, a description, the value including VAT and finally the quantity. The quantity of dotations has to be equal to the number of winners. Kontest automatically selects 1 winner for each prize at the and of the contest. There are two possible cases, depending if you use the periodic mode or not. – If you use the periodic mode and you don’t want to draw the winners after each period, you just have to enter the quantity of dotations as described in the first case. Create and complete your dotation and click on “Copy”. You are asked to choose the period in which your want to offer the prize. With the integrated Media Loader you can add a video or a photo to your dotation.